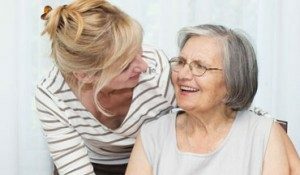 Dementia UK recently worked with the Association for Dementia Studies at Worcester University to refresh its Admiral Nurse Competency Framework. The Competency Framework ensures our Admiral Nurses provide consistent care across the UK and across the different care settings they work in, so families living with dementia get the same high level of care, wherever they may be. Admiral Nurses are highly skilled registered nurses who have specialised in dementia care. We’re proud of their unique background, specialism and experience, and this framework allows us to make sure that their skills, knowledge and abilities are consistent and evidence-based. It will also help the nurses articulate their expertise and achievements throughout their personal development, so that they have a structure to work by and benchmark the high standards of work that they engage in. What is the Admiral Nurse Competency Framework? The Nursing and Midwifery Council (NMC) define competence as the consideration of a nurse’s competence as a whole, combining the skills, knowledge and attitudes, values and technical abilities that underpin safe and effective nursing practice and interventions (NMC, 2010). The Prime Minister’s Challenge on Dementia 2020 (Department of Health, 2015) and The Prime Minister’s Challenge on Dementia 2020: Implementation Plan (Department of Health, 2016). Clinical Academic Careers Framework (Health Education England, 2015). How to revalidate with the NMC (NMC, 2015a). Dementia Core Skills Education and Training Framework (Skills for Health, Health Education England and Skills for Care, 2015). An RCN guide to advanced nursing practice, advanced nurse practitioners and programme accreditation (RCN, 2012). Scotland’s National Dementia Strategy (The Scottish Government, 2010). 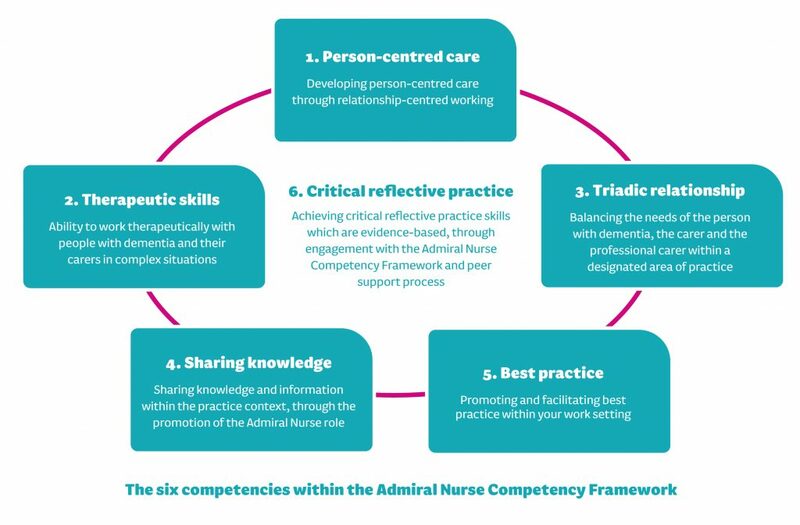 The Admiral Nurse Competency Framework enables Admiral Nurses to develop and maintain an ongoing professional portfolio of collected evidence about their practice through the use of the PebblePad e-portfolio system. The levels used within the Admiral Nurse Competency Framework are unique to Admiral Nursing and reflect the specialist nature of its work. Three levels of attainment are described and the competency framework approach allows Admiral Nurses to develop their practice and provide evidence to demonstrate each level: Specialist; Enhanced Specialist; and Advanced Specialist. Person-Centred Care: Developing person-centred care through relationship-centred working. Therapeutic Skills: Ability to work therapeutically with people with dementia and their carers in complex situations. Triadic Relationship: Balancing the needs of the person with dementia, the carer and the professional carer within a designated area of practice. Sharing Knowledge: Sharing knowledge and information within the practice context, through the promotion of the Admiral Nurse role. Best Practice: Promoting and facilitating best practice within your work setting. Critical Reflective Practice: Achieving critical reflective practice skills which are evidence based, through engagement with the Admiral Nurse Competency Framework and a peer support process.